The city of Rishikesh has always sparked my imagination ever since I started practicing yoga. So finally, this year while in India I decided to make a detour and spend a couple of weeks in this holy city which is located on the banks of the Ganga, the sacred river that flows down from the Himalayas. During my stay, I was able to observe numerous sadhus roaming on pilgrimage around this formidable city. (Sadhus are holy men living on the fringes of society; most people call them “babas.”) These holy men have been wandering around mother India for perhaps thousands of years, leading a life of celibacy focused on ascetic yoga and spiritual practices. It’s possible to see many of them walking along the roads, or sitting near temples in places such as Varanasi, Rishikesh, Tiruvamalai and Abramabad. Some live in ashram, while others live hidden in caves, secreted in forests all over India. Their appearance is often dramatic and sometimes scary. Some wear robes, some cover themselves with ash, some paint their faces with religious symbols. It’s easy to recognize the babas, as they very often carry a begging bowl in one hand and a walking stick in the other. People generally give them food or money in return for their blessings and prayers. Their energy and presence is typically very strong and sparks in me a mixture of fear, fascination and curiosity. While Hindus revere them, I personally have mixed feelings, as I know that not all of them are genuine. I was told that sometimes criminals disguise themselves as sadhu to allow them to hide from the authorities. In spite of seemingly drifting around India and living a lonely life, these sadhus actually belong to different semi-monastic sects. All genuine sadhus have been initiated into a sect. This means that they are part of a hierarchy, an organization that very often owns land, buildings and different assets, etc. I was told there are about sixty of these sects of sadhus. Some of these organizations are opulent, while others are more modest. Most sadhus rely on donations to survive. So how does one become a sadhu? Firstly a sect must accept them. Once the sect has approved them, their initiation usually takes place at Khumba Mela, a pilgrimage which happens every 3 years. The sadhus need to renounce their life, name and previous identity. Afterwards, a ritual is performed, during which they shave all the hair on their body, (including their head,) followed by a holy bath. Once this is completed, they are appointed 5 teachers, (gurus,) within the sect. The sadhu will receive a new name, as well as a secret mantra. Finally, and most importantly, they will be required to perform their own funeral rites to cut all ties with their family, unburdening their family from performing the task. Nag means ‘naked’ and these sadhus are often called Nag Babas. They have matted coils of hair and their bodies are covered in ashes, both of which are features of Lord Shiva. It is said that they are in a state of meditation (tapasya) all year around and are very intense. In ancient times they were warriors, trained in different weapons and sometimes referred to as “warrior-ascetics.” Interestingly, the Naga are divided into Akharas, (regiments,) like in the army. They are the most extreme sadhus. They eat meat, and sometimes even consume human flesh as a ritual to overcome all fear. They often live near cremation sites and are known to smear cremation ash over their bodies and use bones from human corpses as jewelry, as well as drinking alcohol from human skulls. They prefer to practice their tapas, (austerity) secretly, and therefore often scare people away. Also known as Kanphata, (“split-ear yogis”). 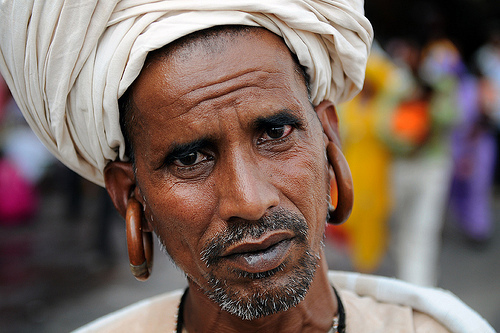 These sadhus are easily recognized by the huge earrings that they wear which split the cartilage of their ears. The Naths claim that the point where they pierce their ears is a special point that gives them mystical powers. They too smear ash on their body or wear black ropes. Sadhus embrace a life of sacrifice, austerity, poverty and hunger with the objective of attaining enlightenment during this lifetime. It begs the question, how many of them truly attain their highest goal and merge with the absolute? Such an extreme lifestyle is certainly a way of piercing the veil of illusion, and not suitable for anyone apart from the most dedicated. Inspired by a wonderful lecture given by Matthew Clark in Goa, India in February 2015 on this topic.